Avocado zucchini salad – embrace a balance of healthy fats with carbohydrates with this delicious avocado zucchini salad. With summer just around the corner I know too darn well some you are fretting about your appearance and anticipating the warm weather. I know it’s so easy to past judgement and berate folks for neglecting their health during the colder months. I strongly believe that we become more idle and complacent when it’s cold “oh it doesn’t matter’ or I can always do that tomorrow’ does this sound like you? Well you’re in good hands because salads are going to be your new best friend, that’s right, it’s that time of year again to shape up and look sharp with this delicious avocado zucchini salad. Salads are one of the easiest and best ways to improve your diet because they’re so simple to pull together and pack a helluva lot of diversity – anything goes in a salad, I sincerely mean that I’ve made countless combinations – some good and others I daren’t speak of. However, this avocado zucchini salad is a great entry level salad. I refer to it as entry level because it’s minimalistic, no fuss and yet really packs a punch, not to mention filling. If you’re trying to lose weight right now or perhaps maintain your weight then this one is for you. Zucchini or as Brits call them courgettes are a favourite vegetable of mine. Their water content is high meaning low in calories and zero cholesterol. Aside from that they contain an excellent source of folates which are an important vitamin for expectant mothers. An adequate amount of folates are required during the early stages of pregnancy due to lowering the risk of fetal defects. 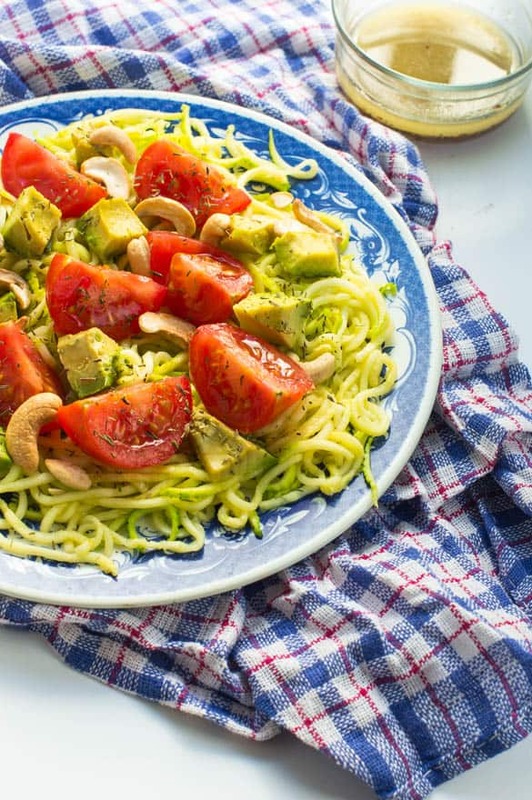 Another thing I did was pair the wonderful zucchini with a selective range of healthy fats – avocado, roasted cashew and extra virgin olive oil to ease inflammation. The olive oil forms a mild dressing along with other ingredients which work considerably well together – thyme, garlic granules, garlic pepper and coconut aminos. As side note for any gents reading this, tomatoes actually help to reduce of developing prostate cancer by 20%. 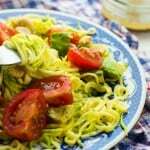 You will need either a spiraliser or julienne peeler to create some vegetable noodles (zoodles). 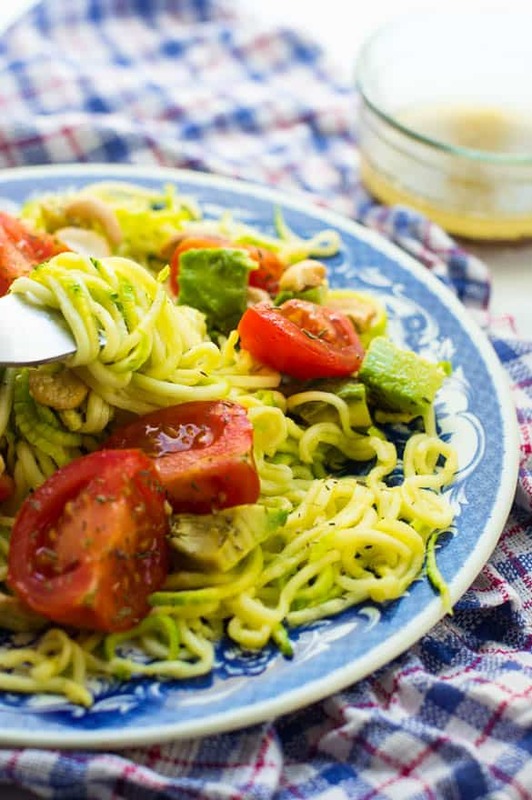 Place the zucchini in a large colander with 1-2tsp of himalayan pink salt and leave to sweat for 10 minutes then rinse off the salt with water and drain the zoodles. Steam the zoodles in a large sauce pan, in a small amount of water for 5 minutes, on medium heat with the lid on, then drain off the excess water. 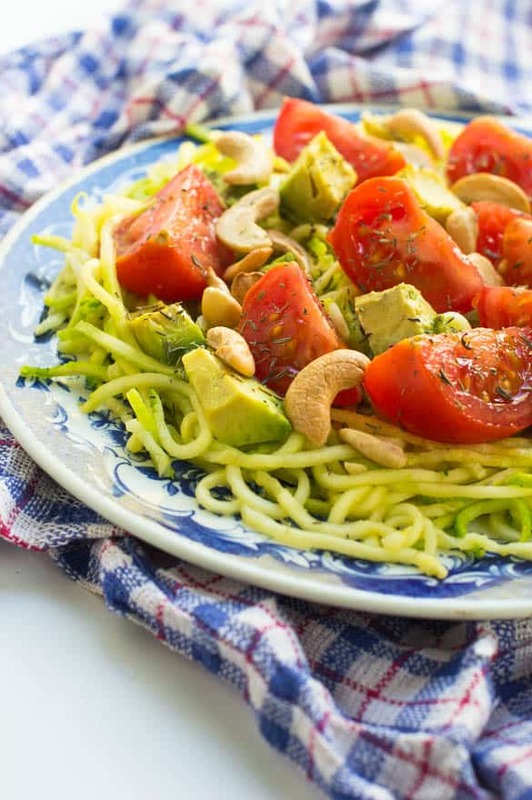 Arrange the zoodles on a serving plate along with the avocado, tomatoes, cashew nuts and sprinkle with the dried thyme. Finally mix all of the ingredients together for the dressing and drizzle the entire salad. Thanks for the timely reminder Charlene, need a few more salads in my life as it’s coming into summer! This one looks so simple but also super healthy – I will give it a shot! Do you serve it warm or cold? It’s a cold salad, you can always skip the part where the zoodles are steamed. I only did this to tenderise them as I like them on the softer side.